SARVER, PA – One could make the argument that both Santa Claus and the Grinch were on hand on Friday night at The Action Track as gifts were given and taken away as late race heroics made for some dramatic finishes when all was said and done. Carl Bowser went straight to work in the Peoples Gas DIRTcar Sprint main event, bolting out to an early lead that would increase to nearly half a track even after he made his through considerable lapped traffic. Former track champion Brandon Spithaler put forth his best effort at running Bowser down for the better part of 25 laps. However, moving forward with authority from his seventh starting spot was Jack Sodeman Jr. who made his way around Spithaler after a lap 22 caution reset the field. One more caution gave Sodeman one last chance to collect the win, and he took full advantage of it as he made his way underneath Bowser in turn four with one lap to go and never looked back en route to his second win of the season. 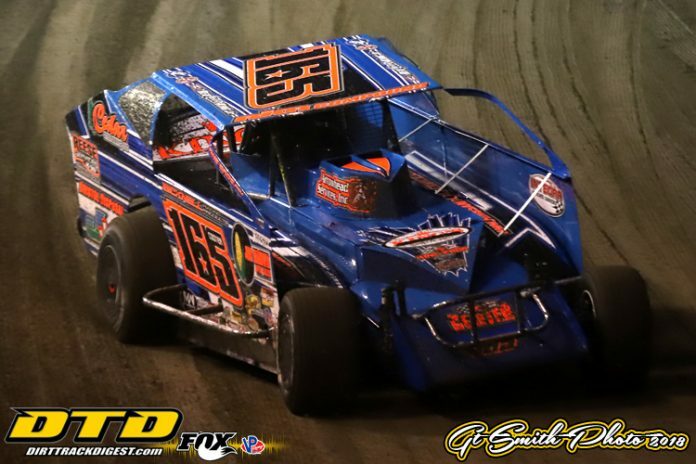 In the Precise Racing Products DIRTcar Late Models, Michael Norris found Terry Bowser Victory Lane for the seventh time in 2018 as he kept his season to remember going strong. Norris had to work hard in the early portion of the main event though as Colton Flinner and Matt Lux were giving him all he could handle in the early portion of the race, trading the lead at different points on the speedway and in the same lap for several laps before Norris was able to make the lead stick for good on lap nine while Lux would move past Flinner for good on lap 16 to earn the runner up spot. John Mollick looked like the driver to beat in the Diehl Automotive DIRTcar Big Block Modified feature as he got out to the early lead and looked strong in doing so. However, Rex King Jr. was a man on a mission as he moved forward from his seventh starting spot and quickly found himself battling Mollick door to door for the lead. King Jr would take it for good on lap nine while behind him, Garrett Krummert had moved from tenth to second as he ran out of laps to catch King Jr. who made his way to Victory Lane for the fourth time this season. Corey McPherson made his way past early leaders Joey Zambotti and Ryan Moyer in the Millerstown Pic-A-Part DIRTcar/RUSH feature and then found himself being hunted down and overtaken by a red hot Jason Fosnaught who was substituting for Brett McDonald. Fosnaught looked to be in control of the field and headed for his first Lernerville win since 2015 until a late race caution set the stage for a green-white-checkered finish. When action resumed, Fosnaught held the lead for one and three quarters laps when McPherson dove underneath him heading into turn three for the final time and emerged with the lead which he converted into his third win on the season while Fosnaught spun coming out of turn four, collecting damage from several cars while coming home in 11th place. Noah Brunell fought tooth and nail for position all night in the top five and was rewarded with a second place finish while Bob Egley took the final podium spot.